Vigo County (/ˈviːɡoʊ/ VEE-goh or /ˈvaɪɡoʊ/ VY-goh) is a county located along the western border of the U.S. state of Indiana. According to the 2010 census, the population was 107,848. The county seat is Terre Haute. Vigo County is included in the Terre Haute, Indiana, Metropolitan Statistical Area. The county contains four incorporated settlements with a total population of nearly 63,000, as well as several unincorporated communities. It is divided into twelve townships which provide local services to the residents. The county is one of the best bellwether regions for voting in U.S. presidential elections; it has voted for the winning candidate in every election since 1956 and in all but two elections since 1888. Only one county in the United States (Valencia County, New Mexico) has voted for the winning candidate longer. Sullivan County was formed in 1817, and the area that later became Vigo County was part of it until 1818, when the county was created by an act of the Indiana General Assembly which took effect on February 1. Its borders changed several times; in 1821, part of the county was formed into Parke County, and later that year Putnam County was formed which also affected Vigo's borders. The final change came in 1873 when the present boundaries were defined. The county is named in honor of Colonel Francis Vigo, of Italian heritage but a citizen of Spain due to residence in St. Louis. He is credited with great assistance to George Rogers Clark both in financing Clark's exploration and American Revolutionary War efforts, and in service as an agent obtaining military information for Clark against British campaigns on the then frontier. To the north of Vigo County, the Wabash River defines the boundary between Vermillion and Parke counties; the river then enters Vigo County and winds to the south-southwest, defining the southern portion of the county's western border before continuing south along Sullivan County's western border. Vigo County is thus the southernmost county in Indiana on the right bank of the Wabash. Clay County lies to the east. Across the state line are Edgar County to the northwest and Clark County to the southwest. According to the 2010 census, the county has a total area of 410.45 square miles (1,063.1 km2), of which 403.31 square miles (1,044.6 km2) (or 98.26%) is land and 7.14 square miles (18.5 km2) (or 1.74%) is water. In 1819, the year after the county was formed, it was divided into four townships: Honey Creek, Wabash, Harrison and Independence. Prairie Creek Township was formed later that year. In the following years more townships were formed and township borders were altered several times. Otter Creek, Raccoon and Sugar Creek townships were created in 1820, and Independence Township became known as Paris Township. Raccoon and Wabash townships became part of Parke County when it was split from Vigo County in 1821. Nevins and Riley were formed in 1822. In 1824, Paris Township was renamed again to Fayette Township. Pierson Township was created in 1829, then Lost Creek in 1831, then Linton in 1841 and finally Prairieton in 1857, for a total of twelve townships. There are four incorporated settlements within Vigo County. The largest, Terre Haute, has a population of almost 60,000 and covers all of Harrison Township and extends into several surrounding townships. 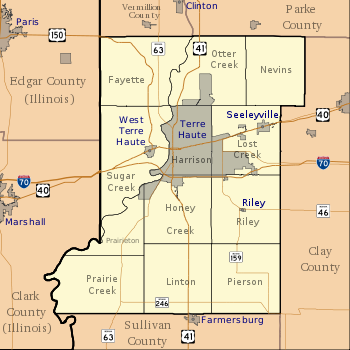 West Terre Haute, as its name indicates, lies to the west, along U.S. Route 40; it has a population of about 2,300. The town of Seelyville lies to the east of Terre Haute, also along U.S. Route 40, with a population of about 1,200. The smallest town, Riley, is southeast of Terre Haute and has a population of only 160. Interstate 70 passes through the southern part of Terre Haute from east to west on its way from Indianapolis to Saint Louis, Missouri; U.S. Route 40 roughly parallels Interstate 70 and passes through the middle of the city. Both highways intersect U.S. Route 41, coming from Chicago to the north; U.S. Route 150 enters from Paris, Illinois to the northwest and joins U.S Route 41 in downtown Terre Haute, and both continue south toward Vincennes. Several CSX Transportation railroad lines meet in Terre Haute; one enters from the north, another from the Indianapolis area, and another from Vincennes; and two others enter from Illinois. There is also an Indiana Rail Road line which runs southeast from Terre Haute toward Bedford. The public schools in the county are part of the Vigo County School Corporation. During the 2009–10 school year, the schools served a total of 16,014 students. Vigo County is served by the Vigo County Public Library. Colleges in Vigo County include Indiana State University and Rose-Hulman Institute of Technology. For a fuller list, see the List of schools in metropolitan Terre Haute. In recent years, average temperatures in Terre Haute have ranged from a low of 18 °F (−8 °C) in January to a high of 87 °F (31 °C) in July, although a record low of −24 °F (−31 °C) was recorded in January 1977 and a record high of 104 °F (40 °C) was recorded in September 1954. Average monthly precipitation ranged from 2.13 inches (54 mm) in January to 4.46 inches (113 mm) in May. The county government is a constitutional body, and is granted specific powers by the Constitution of Indiana, and by the Indiana Code. The county council is the fiscal body of the county government and controls all the spending and revenue collection in the county. Representatives are elected from county districts. The council members serve four-year terms. They are responsible for setting salaries, the annual budget, and special spending. The council also has limited authority to impose local taxes, in the form of an income and property tax that is subject to state level approval, excise taxes, and service taxes. The executive and legislative body of the county is made of a board of commissioners. The commissioners are elected county-wide, in staggered terms, and each serves a four-year term. One of the commissioners, typically the most senior, serves as president. The commissioners are charged with executing the laws and managing the day-to-day functions of the county government. The county maintains a small claims court that can handle some civil cases. The judge on the court is elected to a term of four years and must be a member of the Indiana Bar Association. The judge is assisted by a constable who is also elected to a four-year term. In some cases, court decisions can be appealed to the state level circuit court. The county has several other elected offices, including sheriff, coroner, auditor, treasurer, recorder, surveyor, and circuit court clerk. Each of these elected officers serves a term of four years and oversees a different part of county government. Members elected to county government positions are required to declare party affiliations and to be residents of the county. The county is one of the best bellwether regions for voting U.S. presidential elections; it has voted for the winning candidate in every election since 1956 and in all but two elections since 1888 (1908 and 1952). The results in the county have largely mirrored the nationwide popular vote. In every presidential election from 1960 to 2012, the county voted less than five percentage points from the national result. This changed in 2016, when the county voted nine percentage points more Republican than the nation as a whole. In statewide races for governor and the U.S. Senate, Vigo County has in recent years become more receptive to candidates from the Democratic Party, even when the county had simultaneously voted for a Republican presidential victor in question. The county has gone Democratic in 9 of the last 10 gubernatorial races since 1980, and in 8 of the last 13 Senate races since that year also. Vigo is part of Indiana's 8th congressional district, which is held by Republican Larry Bucshon. As of the 2010 United States Census, there were 107,848 people, 41,361 households, and 25,607 families residing in the county. The population density was 267.4 inhabitants per square mile (103.2/km2). There were 46,006 housing units at an average density of 114.1 per square mile (44.1/km2). The racial makeup of the county was 88.3% white, 6.9% black or African American, 1.7% Asian, 0.3% American Indian, 0.6% from other races, and 2.2% from two or more races. Those of Hispanic or Latino origin made up 2.3% of the population. In terms of ancestry, 22.6% were German, 20.2% were American, 12.2% were Irish, and 10.3% were English. Of the 41,361 households, 30.2% had children under the age of 18 living with them, 43.9% were married couples living together, 13.1% had a female householder with no husband present, 38.1% were non-families, and 30.6% of all households were made up of individuals. The average household size was 2.38 and the average family size was 2.95. The median age was 36.1 years. The median income for a household in the county was $47,697 and the median income for a family was $50,413. Males had a median income of $42,014 versus $30,217 for females. The per capita income for the county was $20,398. About 13.3% of families and 19.5% of the population were below the poverty line, including 27.5% of those under age 18 and 9.5% of those age 65 or over. ^ "Vigo County QuickFacts". United States Census Bureau. Retrieved 2011-09-25. ^ "Indiana Township Association". Retrieved 2010-09-12. ^ a b David Leip (2003). "Bellwether States and Counties". Retrieved 2008-05-17. ^ a b David Leip (2013). "Vigo County, IN Extends Bellwether Streak". Retrieved 2015-10-26. ^ Bradsby 1891, pp. 285–289. ^ Bradsby 1891, pp. 647–649. ^ "Interstate 70". Highway Explorer. Archived from the original on 2012-03-09. Retrieved 2010-12-22. ^ "U.S. Route 40". Highway Explorer. Archived from the original on 2011-10-07. Retrieved 2010-12-22. ^ "U.S. Route 41". Highway Explorer. Archived from the original on 2010-12-07. Retrieved 2010-12-22. ^ "U.S. Route 150". Highway Explorer. Archived from the original on 2010-06-05. Retrieved 2010-12-22. ^ "Indiana Railroads" (PDF). Indiana Department of Transportation. 2008. Archived from the original (PDF) on 2009-11-18. Retrieved 2010-12-22. ^ "Enrollment by Grade, Vigo County School Corp". Indiana Department of Education. Archived from the original on 2012-04-03. Retrieved 2010-12-23. ^ "Homepage". Vigo County Public Library. Retrieved 27 July 2014. ^ a b "Monthly Averages for Terre Haute, Indiana". The Weather Channel. Retrieved 2011-01-27. ^ The leading "other" candidate, Progressive Theodore Roosevelt, received 4,988 votes, while Socialist candidate Eugene Debs received 1,862 votes, Prohibition candidate Eugene Chafin received 707 votes, and Socialist Labor candidate Arthur Reimer received 144 votes. ^ "U.S. Decennial Census". Census.gov. Archived from the original on May 12, 2015. Retrieved July 31, 2013. ^ "Annual Estimates of the Resident Population: April 1, 2010 to July 1, 2012". Census.gov. Archived from the original on July 7, 2013. Retrieved July 31, 2013. Bradsby, H. C. (1891). History of Vigo County, Indiana, with Biographical Selections. Chicago: S. B. Nelson and Company. Retrieved 2010-12-20. Pickett, William B. (chairman). Vigo County Oral History Program (1980-81). Terre Haute, Indiana: Collections: Politics and Government, Vigo County Public Library. 820128A. Wikimedia Commons has media related to Vigo County, Indiana. This page was last edited on 2 December 2018, at 08:39 (UTC).